This interesting photo of the Mystery Knight on the wall of the Temple Bar (this may be a clue) was sent in by David Coates. He is not sure quite when the knight appeared, but he can testify to seeing it in its present position for the last 30 years. 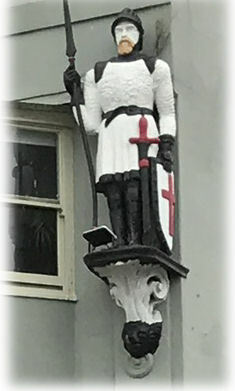 As I also said in my answer to David’s Local History Question on this topic last week, this may possibly depict one of the Knights Templar. They wore a black and white tunic, and carried shields with the red cross ( a symbol of martyrdom apparently) on a white background. At some point, it became customary for them to have long and prominent beards. It seems that initiation ceremonies were performed at Temple Church in London, which also happens to be the Parish Church of the Middle and Inner Temples. I am not suggesting that there is any direct connection between the Knights Templar and the knight in the photo. 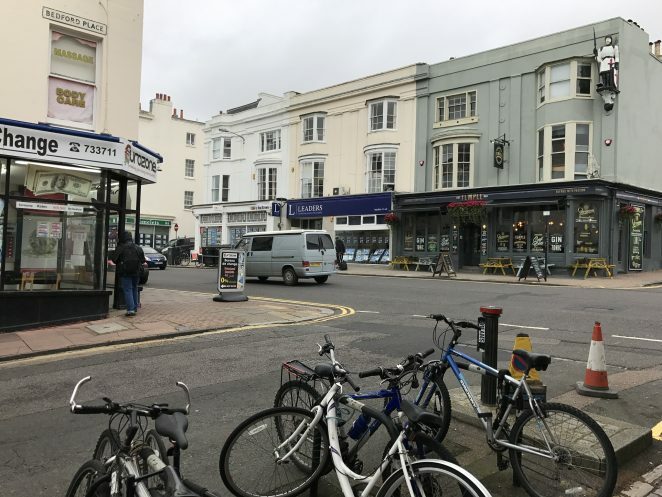 The Temple Bar public house may have taken its name from its position on the corner of Temple Street, or from the Temple, Thomas Read Kemp’s house on the corner of Temple Gardens and Montpelier Road, which is now part of Brighton & Hove High School for Girls. There was once a Temple Inn public house on the corner of Victoria Road and Montpelier Street, but this is now a private dwelling (see elsewhere on this website). I look forward to reading a definitive answer from one of the MyB&H team, as mine is pure conjecture!